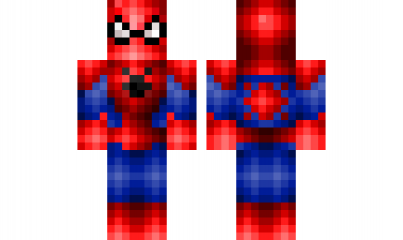 Skin Spiderman 1.2.0 is executed incredibly high quality and stylish, the hero is very similar to Marvel heroes. This skin will give you all the cards in hand, so that you can become as brave, strong and capable. Textures to such a skin are not necessary, the author has already put into it all that is needed – an excellent suit, a stern look and mastery of some skills. For servers, this skin is just perfect. Children can compete among themselves who is stronger, who knows what and much more. What is the special feature of the Spiderman skin? As its implementation and the opportunities that it opens to craftspeople. This is the most beautiful chance to prove yourself as a worthy and respected miner. In any sphere. We all know perfectly well that Spiderman is a hero who is endowed with amazing abilities to climb walls and ceilings and save all who are in trouble, in this case the powers will be much greater. And what is most cool, they can always be added – it depends on your skills and most importantly – the desire! Red and blue suit looks stylish and very impressive – this kind of shame will appear anywhere, in any location. Even if there are many different mobs and bosses ready to eat you or kill you at the first meeting. Skin Spidermen 1.2.0 must be in the collection of your most favorite and sought after skins. Pass in this manner new parkour tests, maps on survival and explore new cities megacities. In general – do what you most like to do in the MCPE.